The four fold crystal symmetry combined with the zero tilt angle may be very troublesome for the interconnects. 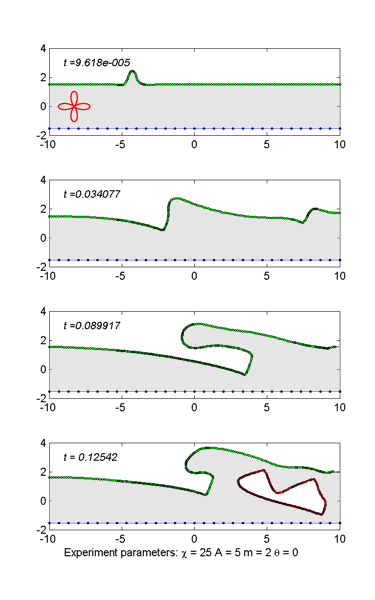 In all range of electron wind intensities χ= 5−50 studied in this work, the edge-Hillock converts into a kink-like wave form, which immediately starts to multiply along the windward direction, especially at high electron wind intensities. The form of the individual waves are stabilized due time, by adapting almost perfect sawtooth shape. This spreading wave package shifts towards the cathode end. For the moderate electron winds, such as χ=25 , the lee side of the hillock transform into wedge shape intrusion pointing to the windward direction. This intrusion produces a very large internal void. This giant size void has very unusual form as illustrated in Figure namely; wedge shapedoublet. Definitely it causes a fatal break down of the interconnect line, when hits the opposite edge.